on YouTube to better my cultural literacy. This method allows me to choose what I want to see, as opposed to being bombarded with the unviewable. Anyway, there are some positive things to say: the acting is quite good, and the characters are compelling in their complexity. The world-building in general is fairly appealing. The bad is obvious: there is a lot of pure garbage thrown in for ratings (the stuff I do my best to circumvent), and the level of graphic violence is nothing less than disturbing. Here's what's even more disturbing: the way some commenters on the show handle this violence. I used to think the reaction to "The Hunger Games" was a bit unnerving, with people seemingly just a bit too eager-beaver about the arena scenes. But with GoT, you start to see the fans actually emotionally investing themselves in the barbaric feuding to the point of taking actual pleasure in seeing certain characters die gruesome deaths because, accordint to their estimation, "they deserved it". Literally, one individual wrote something to the effect that watching one of the characters suffocate was "music to my ears." Perhaps my point is that I sensed the viewers were actually taking pleasure in pain, even if it was fictional. The safety zone of fiction can easily cross over into real life reactions. This makes them on a par with the attitudes of said vile character. But the thought seems to be that vengence is justified and indeed something to relish. 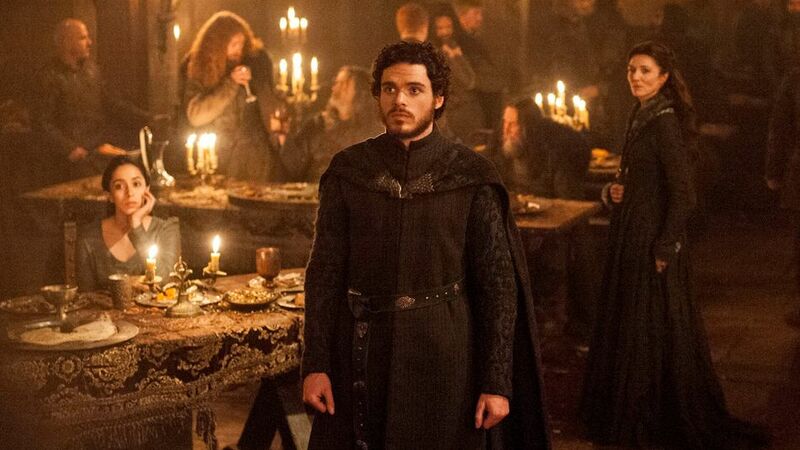 Lastly, I want to comment on the episode "The Red Wedding". I only watched it from a distance on a small screen, as I heard it was really gruesome, with many of the main characters dying by the knife. But the thing that I found most disturbing was not the main characters' deaths. Rather, it was one character's willingness to take revenge on the wife of the murderer, who was being held hostage. Again, there is this pervading sense that we should somehow be proud of said character for taking that revenge; that it was somehow strong and even noble. I say it was weak and cowardly and putting the supposedly "heroic" character on the same par as the man who murdered her son. This is not the way of Christianity, and indeed the story is not set in a Christian world. But is there still not moral law? And is our culture so eager to rally behind "heroes" who are not heroes at all? Heroism is forgiving the unforgivable. Heroism is loving those who hate you and praying for those that persecute you and never, ever becoming that which you are fighting against. Perhaps instead of pop-culture anti-heroes, it is time to turn to the lives of saints. For us Catholics, its the season of Lent, when we seek to transform ourselves through the Grace of Christ and become more fully Human, made in the Image of God. Time to raise the bar.
" I literally had to make myself feel better by looking up the actor who played said character and watching him give an interview to make sure he was okay! :P"
I felt the same about an actor who had acted Creon on Antigone. I was relieved he was OK after seeing it. And in Greek Tragedy, brutal scenes are only told and therefore off stage. Now, I think you are right about this phenomenon. Actually, I was not really happy about The Hunting of Gollum (fan fic free film with content related to Lord of the Rings). How he was restrained in a somewhat brutal way was not quite nice. I fear this subculture of cruelty leads to the popularity of some of our political candidates, and not the other way 'round. I fear some of the politics in place since 50 or more years has led to a sub culture of cruelty. Like school compulsion, compulsory further delays for marriage, child welfare and a few more. Continued : let's not forget allowing abortion, and contraception. That must have desensitised enormously! The comments section of YouTube can be a dark place, especially with a show like GoT.